Here is a recap of every team that won a state title during the 2017 fall sports season. For select sports, an individual champion is listed. Check back for the winter and spring editions. Class 4A: Spanish Springs defeated Arbor View, 53-91. — Spanish Springs’ Andrew Ribeiro won the individual title with a time of 16 minutes, 52 seconds for 3.1 miles. Class 3A: Spring Creek defeated Elko, 43-48. Tech was third with 103. — Spring Creek’s William Fallini-Haas won the individual title with a time of 16:39 for 3.1 miles. Class 2A: North Tahoe defeated The meadows, 29-50. — Sierra Lutheran’s Jared Marchegger was the individual champion with a time of 17:04 for 3.1 miles. Class 4A: Centennial defeated Damonte Ranch, 53-70. — Spanish Springs’ Alexis Melendrez won the individual title with a time of 19:41 for 3.1 miles. Class 3A: Spring Creek defeated Truckee 34-59. Desert Pines was fourth with 116. — South Tahoe’s Carissa Buchholz won the 3.1-mile race in 19:52. Class 2A: North Tahoe defeated The Meadows, 14-50. — The Meadows’ Ellen Hirsberg won the individual race with a time of 20:30 for 3.1 miles. Class 4A: Bishop Gorman defeated Reed, 48-7. 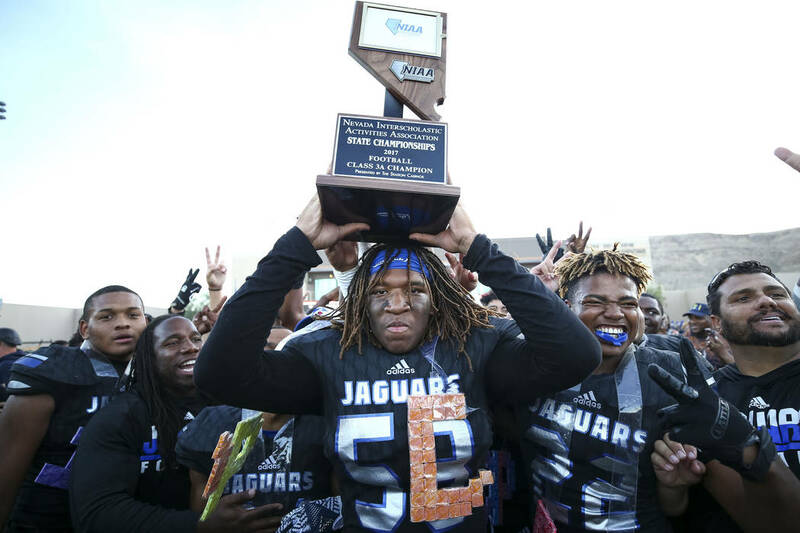 Class 3A: Desert Pines defeated Mojave, 54-24. Class 2A: Pershing County defeated Battle Mountain, 35-24. Class 1A: Pahranagat Valley defeated Spring Mountain, 68-18. Class 4A: Coronado defeated Bishop Gorman, 600-633. — Faith Lutheran’s Sydney Smith shot 2-under-par 142 to win the individual title by two strokes over Bishop Gorman’s Hunter Pate and Palo Verde’s Annick Haczkiewicz. Class 3A: Boulder City defeated Elko, 704-741. — Boulder City’s Lani Potter shot 5-over-par 149 to win the individual title by eight strokes over Western’s Carolyn Lemon. Class 2A: Sierra Lutherna defeated West Wendover, 928-1,026. — Sierra Lutheran’s Kami Niles shot 34-0ver-par 178 to win the individual title by four strokes over West Wendover’s Sarah Isaacs. Class 4A: Coronado defeated Wooster, 2-1. Class 3A: Sunrise Mountain defeated Sparks, 5-0. Class 4A: Bishop Gorman defeated McQueen, 3-0. Class 3A: Truckee defeated South Tahoe, 2-0. Class 4A: Palo Verde defeated Clark 10-9 (4-2 on the tiebreaker). — Palo Verde’s Axel Botticelli defeated Clark’s Artem Iermolov 6-3, 6-1 for the singles title. Clark’s Michael Pasimio and Simran Shah topped Desert Oasis’ Caiden Jacob and Tyler Parlade 6-1, 6-2 for the doubles crown. Class 3A: Boulder City defeated The Meadows, 13-5. — Truckee’s Zach Haas defeated Western’s Rua Elmore 3-6, 7-6 (3), 6-2 for the singles championship. In doubles, Truckee’s Zach Larson and Noah Warren teamed to beat The Meadows’ Justin Finseth and Ben Goodman 6-4, 6-4 in the final. Class 4A: Coronado defeated Bishop Gorman, 12-6. — Clark’s Audrey Boch-Collins beat Tara Chilton of Bishop Manogue 6-0, 6-1 for the singles crown. Palo Verde’s Isabella Shelton and Shelby Graber beat Coronado’s Megan King and Sidra Wohlwend 6-1, 5-7, 6-1 in the doubles final. Class 3A: The Meadows defeated Boulder City, 15-3. — Boulder City’s Olivia Mikkelson defeated Lindsay Hofflander of The Meaodws 6-3, 6-1 for the singles title. The Meadows’ Peyton Barsel and Grace Nemec defeated teammates Claire Strong and Isabelle Monroe 6-3, 6-1 for the doubles championship. Class 4A: Shadow Ridge defeated Bishop Gorman, 3-2 (26-24, 18-25, 25-13, 21-25, 15-9). Class 3A: Boulder City defeated Moapa Valley, 3-2 (17-25, 27-25, 14-25, 25-16, 15-12). Class 2A: The Meadows defeated Yerington, 3-2 (19-25, 22-25, 25-14, 26-24, 15-13). Class 1A: Pahranagat Valley defeated Owyhee, 3-0 (25-11, 25-19, 25-16).